1Department of Clinical Sciences, College of Veterinary Medicine, University of ShahreKord, ShahreKord, Iran. 2Department of Pathobiology, College of Veterinary Medicine, University of ShahreKord, ShahreKord, Iran. Objective- Current trends emphasize the acceleration of fracture healing on the ground that in doing so, the limitation of mobility and complications associated with recovery period are reduced. The present study aims to compare autogenic costal cartilage with Chitosan scaffold in canine humeral defect healing. Procedures- Dogs were divided into three groups of five. Humerus window shaped defect was created in their right hands. In the first group (controls), the defect was left untreated. In the second and third groups, Chitosan and autogenic costal cartilage were placed into the defects, respectively. Radiographs of the defects were prepared at weeks 2, 4, 6 and 8 and finally the dogs were euthanized after 70 days. Histological sections were also obtained from the defect sites. Result-The results indicated that the costal cartilage alone treated group was inferior to both Chitosan treated and control groups, so cartilage does not seem to serve as a suitable alternative for grafting in canine bone defects. Conclusion and Clinical Relevance- Taking into account the results and other recent reports, it can be concluded that chitosan scaffolds with greater capabilities can be used in canine bone defect healing, however, for ideal bone tissue regeneration, chitosan as a base has to be combined with other materials including those mentioned above. The present study results showed that cartilage cannot serve as a proper alternative for grafting. Acceleration of fracture healing process is currently a major area of interest to practitioners because in doing so, the limitation of mobility and complications during recovery period are reduced to a large extent. Great deal of research is conducted investigating the materials which can help meet such a need. Costal cartilage is translucent with the possibility to become hypertrophic and biopsied, leaving least damage on the site. During recent years, the use of such a cartilage or processed type in the culture medium has been investigated. In the present study, costal cartilage was placed in the defect created in the dog humerus. Polymer scaffold is another bone graft substitute made by joining together the small units or monomers. Finally, Chitosan scaffold is a natural polymer used in bone tissue engineering in the past years.5 Chitosan is derived from deacetylated chitin, a constituent of exoskeleton in arthropods/crustaceans such as crabs or shrimps. It is among the biomaterials which can be used as a scaffold with varying pore/cavity size in bone tissue engineering. Biocompatibility and antibacterial property are the characteristics of this material and in contrast to most of synthetic polymers, Chitosan is hydrophilic and reportedly can serve as a suitable scaffold used in combination with other polymers.6,7 in this study, the effects of chitosan scaffold alone on the humerus bone defect healing in dogs were evaluated. We used dogs on the ground that the results are comparable to those on humans, as indicated by Standard world Food and Drug Administration. Accordingly, some pharmaceutical companies seek to investigate the effectiveness of the drugs on dogs.8 The current study, was aimed to evaluate the effects of costal cartilage and chitosan alone on the long bone defect healing in dogs and to compare the respective results. long. To defreeze the product, it was re-stored for 24 hours at -18 °C in a freezer and finally transferred to a fridge and stored at 4 °C. Following these steps, a white porous spongy like product was obtained. Fifteen adult male dogs weighing about 20 kg and aged 2-3 years were prepared for surgery. They were kept in special cages for 10 days to get used to new conditions. Feeding and conditions were the same for all the dogs which were fed meat and bone on daily basis. They had access to water at all times. Having approved their health status clinically and paraclinically, and subcutaneous administration of %1 Ivermectin, and anti-parasite medication(Razak Ivectin®1% ) at a dose of 600 mg/kg and repeating in two weeks, the dogs were randomly assigned to three groups of five. To prepare them for surgery, they were anesthetized with a combination of ketamine (10mg/kg) and diazepam (5mg/kg) followed by inhalation anesthesia with halothane. The inner forearms were shaved and prepared for surgery after draping and scrubbing. To remove a window shaped piece of humorous, an incision was made in the craniomedial and the skin, connective tissue and muscle were removed so that humerus bone appeared where we cut a piece 2 cm long and 1 cm wide. Finally, a rectangular bone of that size from the inner surface of humerus was prepared. As for the control group, the window shaped gap was left empty. To harvest cartilage in the autogenic cartilage treated group, the skin on the distal end of 6th and 7th ribs was shaved simultaneously. After draping and scrubbing, an incision of required size was made on the respective cartilage for grafting and placed it in the defect. In the chitosan treated group, adequate amount of already prepared Chitosan sterilized by nano sterile apparatus was removed and placed in the gap/defect. Finally, after transplantation, muscles and subcutaneous tissues were sutured in two layers using vicryl no.1 thread and the skin by non-absorbable nylon no.1 thread. To prevent infection, penicillin at a dose of 20,000 U/kg IM was administered to the treated groups once a day for 3 days. SPSS software was used for statistical analysis. The obtained results were analyzed by Kruscal-Wallis non-parametric ANOVA and in case of p<0.05, they were re-analyzed by Mann-Whitney test. The level of significance for the tests was set at P<0.05. Evaluation of the radiographs revealed no significant difference between the three groups although bone formation in costal cartilage and Chitosan groups was respectively inferior and superior, compared to each other pair of groups (Table2) (Fig 1-3) . Histopathological study indicated little improvement in the bone defect healing in costal cartilage treated group. Despite the initiation of in situ bone marrow cavity formation indicating the conversion of cartilage to bone, cartilage tissue was present (Fig 4). In the control group, formation of cancellous bone in the fracture space and appearance of bone marrow cavities along with red bone marrow were evident (Fig 5). Also, in chitosan treated group, formation and remodeling of cancellous bone in the fracture space with enlarged bone marrow space and presence of red bone marrow were more evident than other groups (Fig 6). Statistical analysis showed a significant difference between control and costal cartilage groups in terms of cancellous bone criteria, cortical bone and union (P=0.01, P=0.01, and P=0.04, respectively). Accordingly, autogenic cartilage treated group was found inferior to the controls. The same findings were also true for Chitosan and costal cartilage groups (P=0.04, P=0.01, and P-0.04, respectively), i.e., the latter group was inferior to the former. Although chitosan group was relatively superior to costal cartilage counterpart, the difference was not statistically significant (Table 1). Given that most bone formation occurs through endochondral ossification ,i.e., when cartilage is converted to bone, cartilage can be used in bone defect healing.2 Therefore, in this study conducted on dogs, we harvested autogenic costal cartilage, placed it in the bone defect of the dog’s humerus and evaluated its effect on the defect healing. Parallel to that, we placed Chitosan scaffold in the defect created in another group of dogs and compared the efficacy of the two materials; cartilage and chitosan, in bone defect repair in an animal model. In 2016, Nivedhitala et al examined the structure of chitosan- gelatin combination scaffold and suggested that the pores within such scaffolds play a critical role in the connection, formation and infiltration of cells. According to these researchers, scaffolds made from polymers have good mechanical properties but not adequate bone conduction for bone regeneration, so ceramic particles such as calcium phosphate, hydroxyapatite, and bioglass are introduced into them to promote the conduction.16,17 In the present study, although chitosan scaffold alone with no combination of any other material was used, the chitosan treated group was found superior to the control and cartilage groups, indicating the properties of chitosan and presence of higher porosity, compared to cartilage. Perhaps the crushing of cartilage prior to insertion into the defect and longer period of study yields better results on the use of cartilage. Taking into account the results and other recent reports, it could be concluded that chitosan scaffolds with greater capabilities could be used in canine bone defect healing, however, for ideal bone tissue regeneration, chitosan as a base has to be combined with other materials including those mentioned above. As for cartilage use in canine bone defect healing, the present study results showed that cartilage could not serve as a proper alternative for grafting and to improve its efficiency, it is suggested that cartilage be processed beforehand and made ready for grafting. Lacroix D, Prendergast P. A mechano-regulation model for tissue differentiation during fracture healing: analysis of gap size and loading. Journal of biomechanics 2002;35:1163-1171. Bardsley K, Kwarciak A, Freeman C, Brook I, Hatton P, Crawford A. Repair of bone defects in vivo using tissue engineered hypertrophic cartilage grafts produced from nasal chondrocytes. Biomaterials 2017;112:313-323. Damien CJ, Parsons JR. Bone graft and bone graft substitutes: a review of current technology and applications. Journal of Applied Biomaterials 1991;2:187-208. Arrington ED, Smith WJ, Chambers HG, Bucknell AL, Davino NA. Complications of iliac crest bone graft harvesting. Clinical orthopaedics and related research 1996;329:300-309. Lee S-H, Shin H. Matrices and scaffolds for delivery of bioactive molecules in bone and cartilage tissue engineering. Advanced drug delivery reviews 2007;59:339-359. Drewnowska O, Turek B, Carstanjen B, Gajewski Z. Chitosan–a promising biomaterial in veterinary medicine. Polish journal of veterinary sciences 2013;16:843-848. Saravanan S, Leena R, Selvamurugan N. Chitosan based biocomposite scaffolds for bone tissue engineering. International journal of biological macromolecules 2016. Pearce A, Richards R, Milz S, Schneider E, Pearce S. Animal models for implant biomaterial research in bone: a review. Lane JM, Sandhu H. Current approaches to experimental bone grafting. The Orthopedic clinics of North America 1987;18:213-225. Heiple K, Goldberg VM, Powell A, Bos G, Zika J. Biology of cancellous bone grafts. The Orthopedic clinics of North America 1987;18:179. Saifzadeh S, Hobbenaghi R, Hodi S. Elastic cartilage grafting in canine radial fracture. 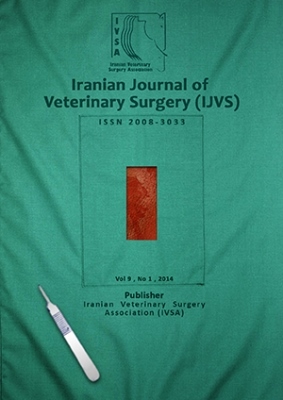 Iranian Journal of Veterinary Research 2006;7:1-7. Montufar-Solis D, Nguyen H, Nguyen H, Horn W, Cody D, Duke P. Using cartilage to repair bone: an alternative approach in tissue engineering. Annals of biomedical engineering 2004;32:504-509. Pippenger BE, Ventura M, Pelttari K, Feliciano S, Jaquiery C, Scherberich A, Walboomers XF, Barbero A, Martin I. Bone‐forming capacity of adult human nasal chondrocytes. Journal of cellular and molecular medicine 2015;19:1390-1399. Li X, Wang X, Zhao T, Gao B, Miao Y, Zhang D, Dong Y. Guided bone regeneration using chitosan-collagen membranes in dog dehiscence-type defect model. Journal of Oral and Maxillofacial Surgery 2014;72:304. e301-304. e314. Prabaharan M, Mano J. Chitosan-based particles as controlled drug delivery systems. Drug delivery 2004;12:41-57. Junqueira LC, Carneiro J. Basic histology text and atlas: London: McGraw Hill, 2005, 2005. Sundaram MN, Deepthi S, Jayakumar R. Chitosan-Gelatin Composite Scaffolds in Bone Tissue Engineering. Chitin and Chitosan for Regenerative Medicine: Springer, 2016;99-121.